Game day w/TV, Roku, and DVD to watch. Dishes for a crowd. What a catch! Red snapper caught from the beach. 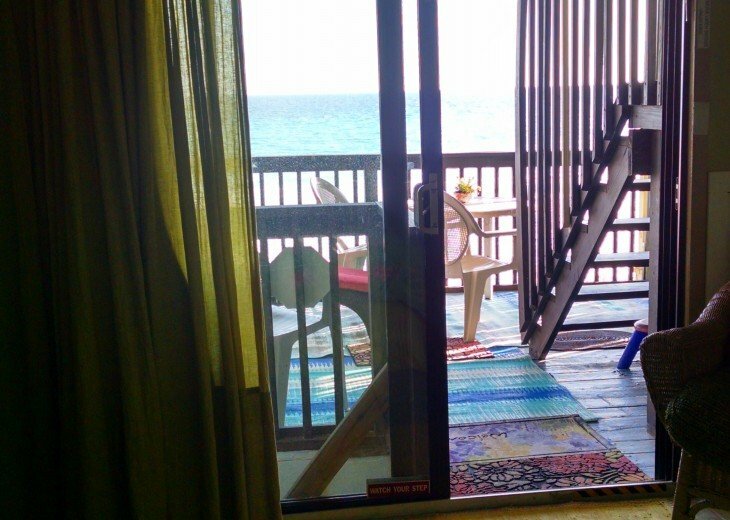 You won't believe how cheaply you can rent an entire house on the beach: cheapee than a hotel. Ask about the year round discount, which is not posted. Ask about our FREQUENT RENTERS PROGRAM. You must e-mail me to get our discounted rates, which are not posted. We rent ONLY from Saturday to Saturday. We only rent the entire house. 2 BRs and shared BA on ground floor. Each BR has a private entrance to the BA. Small kitchenette. Deck over beach. Second floor:. 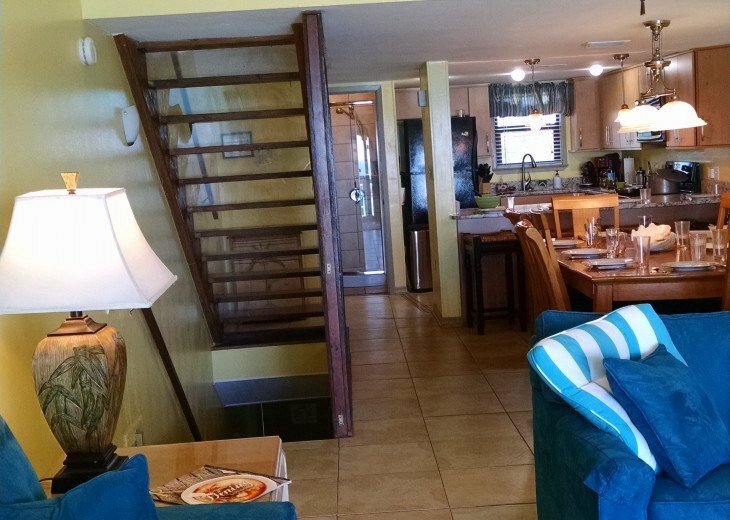 LR w/2 queen sleepers, DR w/8 chairs, bar w/4 stools, fully-equipped kitchen, shower. Deck over beach. Third floor: 2 BRs w/ensuite BAs. Deck over beach. Snorkel the new reef in front of Pompano Joe's - adjacent to our beach. We are Pet Friendly, but do not charge a Pet Fee. All decks and floors have safety gates. 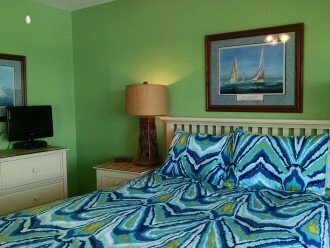 We are Children Friendly and have 2 Pak 'n Plays w/linens and a High Chair for the little ones, as well as lots of beach games and toys. We have silverware and plates for them. They even have their own child-size chairs for the decks. Each deck and each floor have child safety gates. Children or adults can sleep on the 2 Queen sleepers, which can be used at the same time, on the second floor, where there is a BA w/shower. Those 2 sleepers accommodate 4 more people. From your 3 private decks, gaze at one of the most beautiful views in the world: white sand, emerald green water, and incomparable sunsets and sunrises. 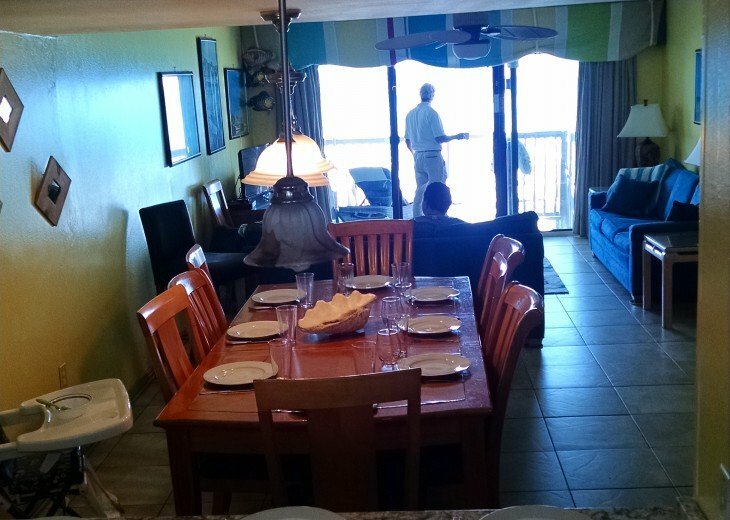 Grill up a fresh piece of fish for dinner and serve it at the table on the deck, where you can enjoy the view over the beach and surf. Serve it w/homemade margaritas and ice cream made using 2 of our many appliances. For lunch, use the shrimp boiler to prepare several dozen fresh shrimp and serve w/grilled corn. Propane is provided at no charge. For breakfast, serve up homemade waffles and French-pressed coffee. Develop your tan lying on cushioned chaise loungers on any of the 3 decks. The 2 upper decks have large umbrellas to shield you from the sun after a long day lying on the sand. All decks have tall bar chairs. At sunset enjoy a drink from any of the 3 decks, all of which are equipped w/table, chairs, chaise lounge, and drinks table. Take off your shoes, put your toes in the white sand, and forget your cares. We also have a sand deck, where you can store your beach necessities and shower off the sand when you're through playing in the crystal clear water. 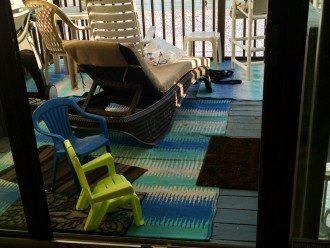 That deck has the amenities for the beach: toys, games, floats, mats for the sand, old chairs, old chaises, rocking chair in the shade, for rocking your babies, Adirondack chairs, huge umbrella for the beach, badminton, ball toss, volleyball, horseshoes, etc. 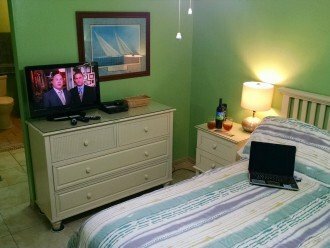 Secured High-speed internet throughout house and on decks over beach. Netflix and Smart TVs throughout house. Guidebook to house and area provided. CO and Smoke Detectors and fire extinguishers in all rooms and LR. First Aid kit, alcohol, vinegar provided. Multiplug outlets in all rooms. Plug-in all your electronics. WE ONLY RENT THE ENTIRE HOUSE. 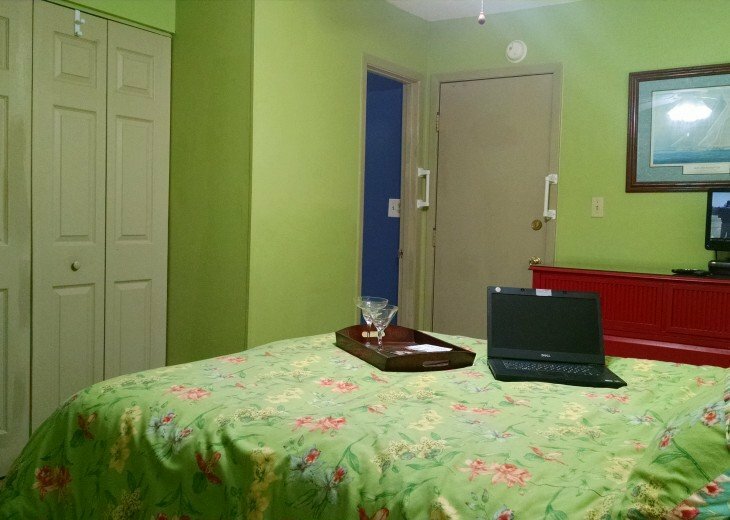 We do not rent the upstairs and downstairs separately, nor do we rent by the day. There are 2 deeded parking places, which will accommodate 4 vehicles. 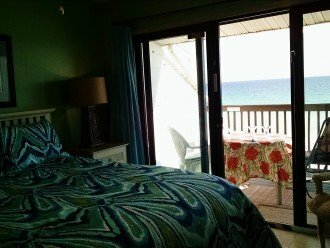 Step directly out on to the white sugar sand beach or relax on decks w/romantic views of the Emerald green Gulf. 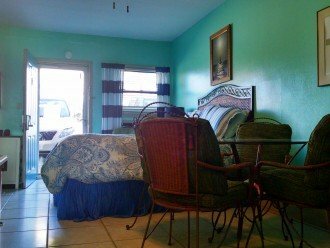 Tile floors throughout, w/three decks over the beach, includes connected private apartment on first floor. 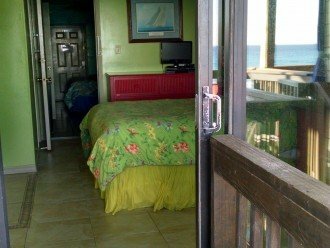 Apartment has its own front door and its own deck w/steps down to the beach and steps up to the 2nd floor deck. It also has its own interior door to the upstairs. 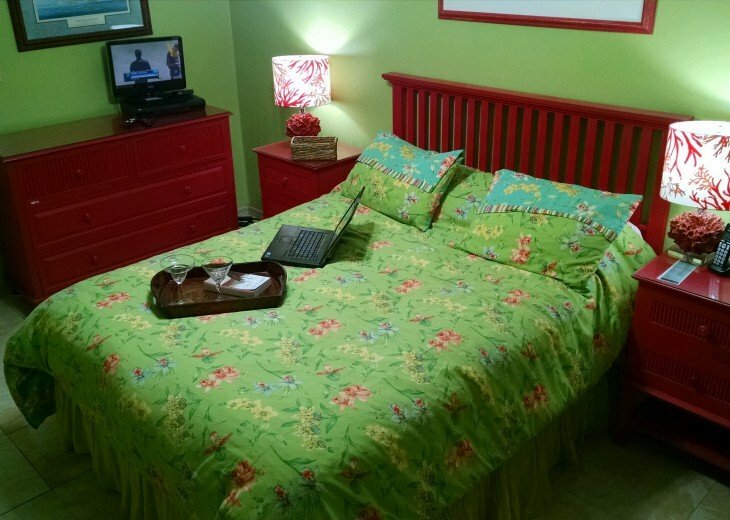 Secured internet and DVDs and Smart TVs in each bedroom and LR. DVDs and video/book library available. Complimentary wine upon check-in. Gourmet coffee packs; shampoos and soaps. 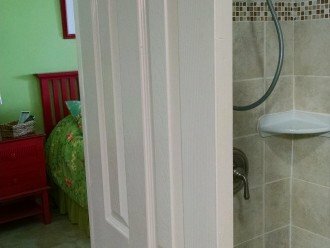 All BAs are ceramic and are tiled, w/glass doors. Ground floor apartment BA is a walk-in shower w/railing and bench for those w/disability challenges. 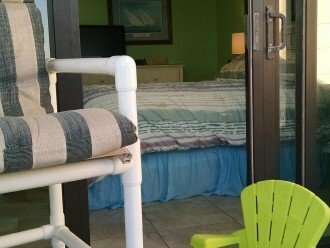 Bed has removable railings to assist those w/disability challenges. Wheelchairs, which are equipped w/special wheels for the sand, can be rented or obtained at no charge from the adjacent County park. 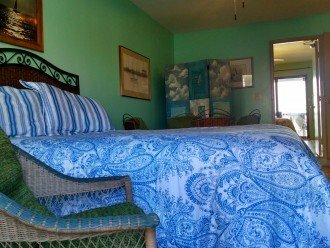 All beds are Queen pillowtops to encourage sleeping in to the sounds of the surf. 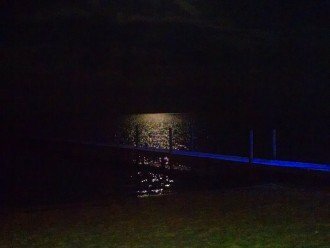 Walk next door to eat at Pompano Joe in the adjacent county park or down to the Whale's Tail or Cabana Cafe. 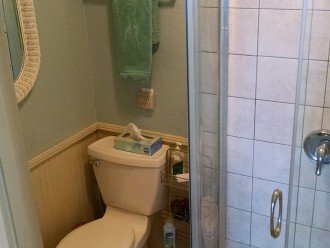 ENTIRE TOWNHOUSE (3-story) has 4 BAs, 4 BRs. 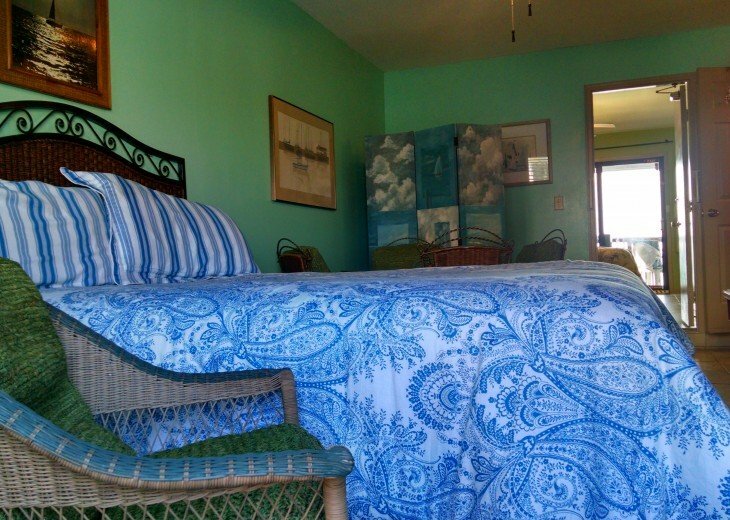 There are 4 Queen beds and 2 Queen sleepers, which can be used at the same time to accommodate 4 more people. 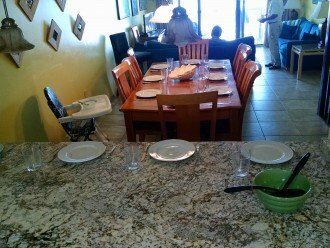 Entire house rental includes the connected ground floor Apartment and upper 2 floors: We provide 1 high chair, 2 port-a-cribs, bathtub, and 3 safety gates for all floors for babies and pets. Decks have safety gates, as well. 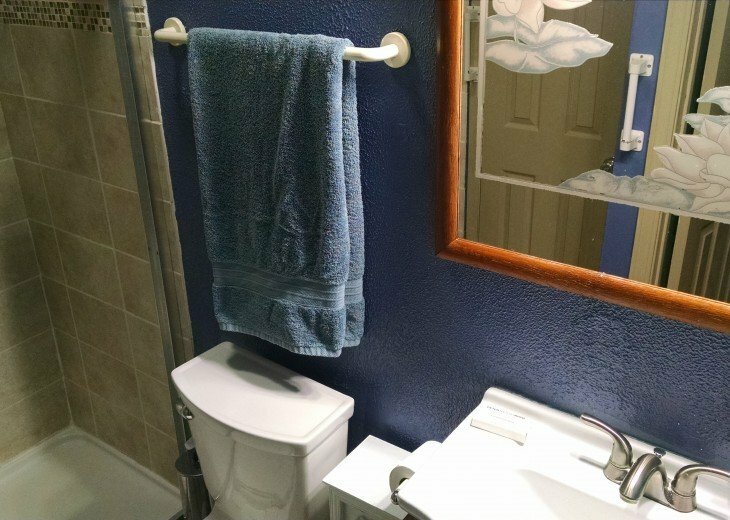 2 BR, 1 BA: GROUND FLOOR APARTMENT, which has its own private front door but is connected to the upstairs via an interior door. There are 2 front doors. 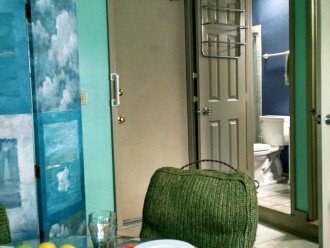 The right door goes immediately upstairs to the second floor, and the left door goes straight into the ground floor Apartment, which has 2 BRs and 1 full shared (Jack 'N Jill) BA. 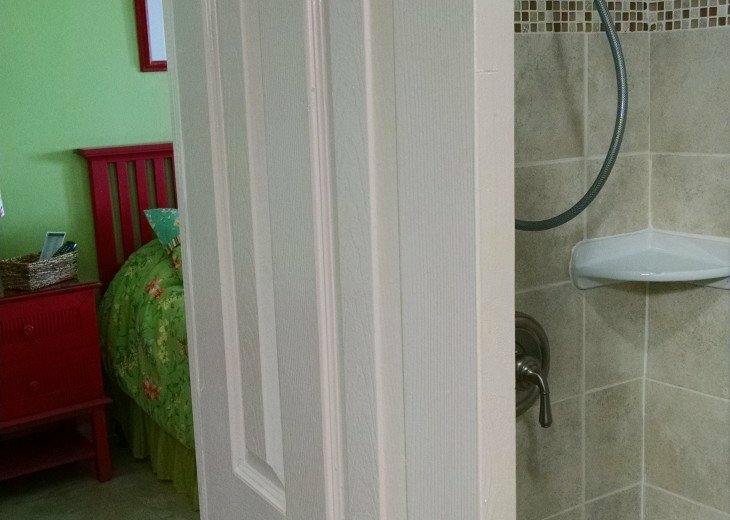 Each BR has its own private entrance to the shared BA w/walk-in shower. 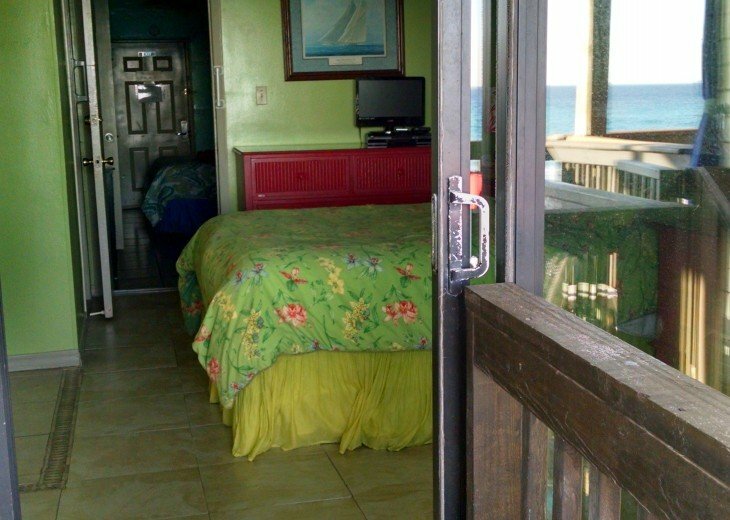 From inside that first apartment streetside BR, there is a door to the upstairs, as well as a door into the apartment's beachside BR, which is where the washer/dryer is located. 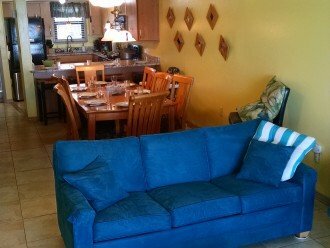 STREETSIDE APARTMENT BR: has Queen pillowtop, Smart TV, DVD, full-size fridge, small dining table, small kitchenette with: microwave, sink, dishes and appliances. It has its own private door to the shared BA. Kitchen and both BRs have fire extinguishers, smoke, and CO detectors. Secured internet operates throughout the house and on the decks. 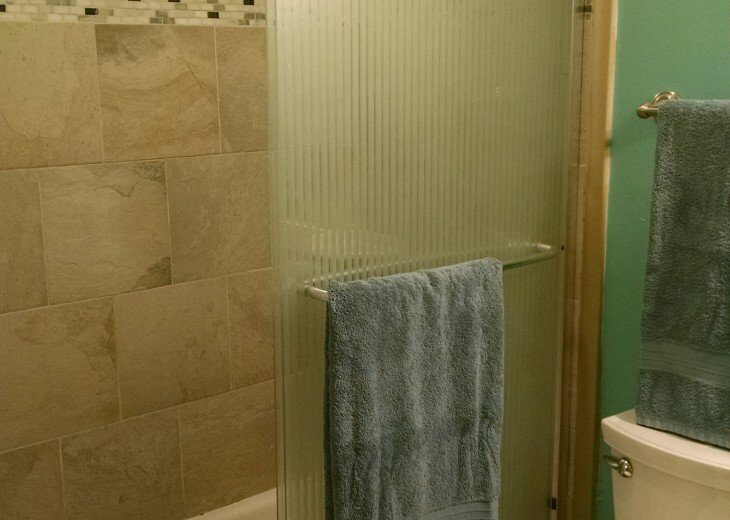 Ground floor BA is a walk-in tiled shower w/glass door and w/railing and bench for those w/disability challenges. In vanity, you will find plenty of soaps, shampoos, alcohol, bandaids, and vinegar for jellyfish stings. 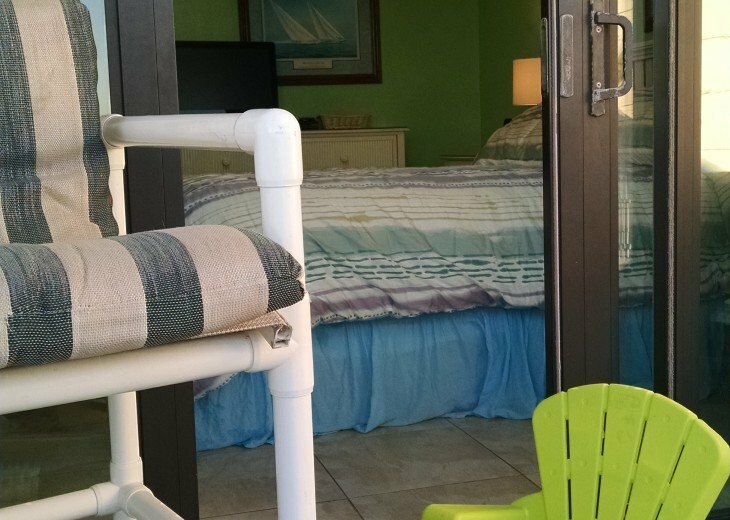 Removable railings can be placed between the mattress and box springs to assist those w/disability challenges. 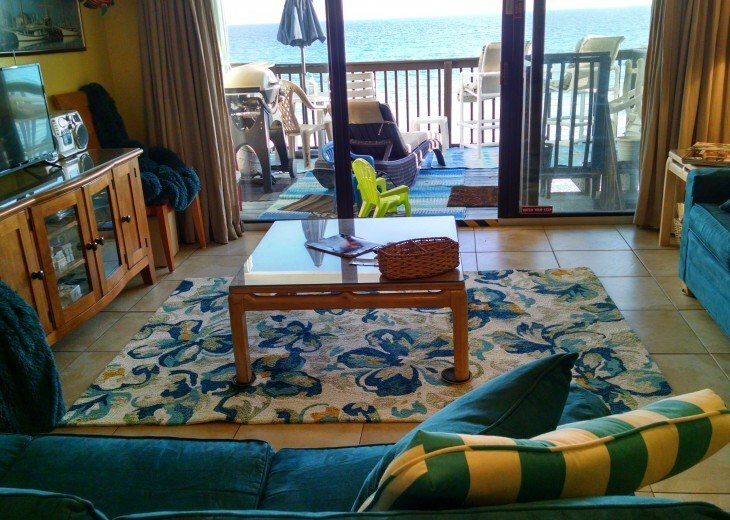 BEACHSIDE APARTMENT BR: has a deck over the beach w/dining table, chairs, and lounger w/cushion for afternoon naps. 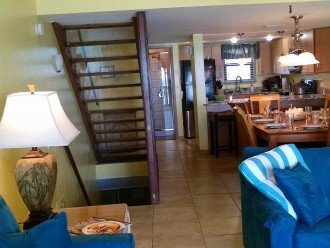 There are outside stairs to the 2nd floor LR deck, as well as stairs down to the beach. 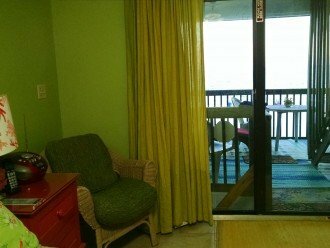 Therefore, renters, who are staying upstairs, don’t have to go through the private apartment to get to the beach. 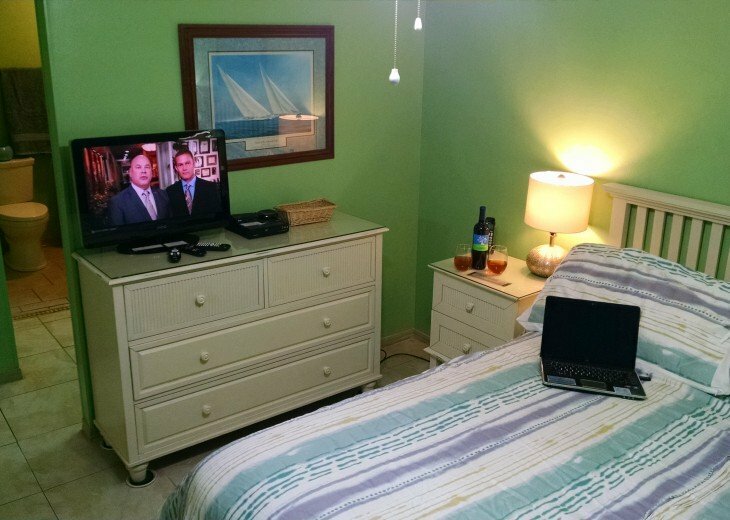 BEACHSIDE APARTMENT BR: has queen pillowtop, Smart TV, DVD, washer/dryer. It has its own private door to the shared full BA. 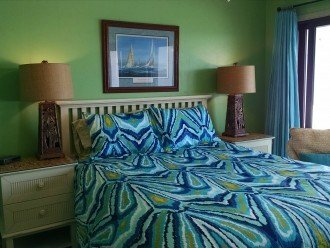 SECOND FLOOR: has the LR w/2 Queen Ethan Allen sleepers, which can be used at the same time to accommodate 4 more people. 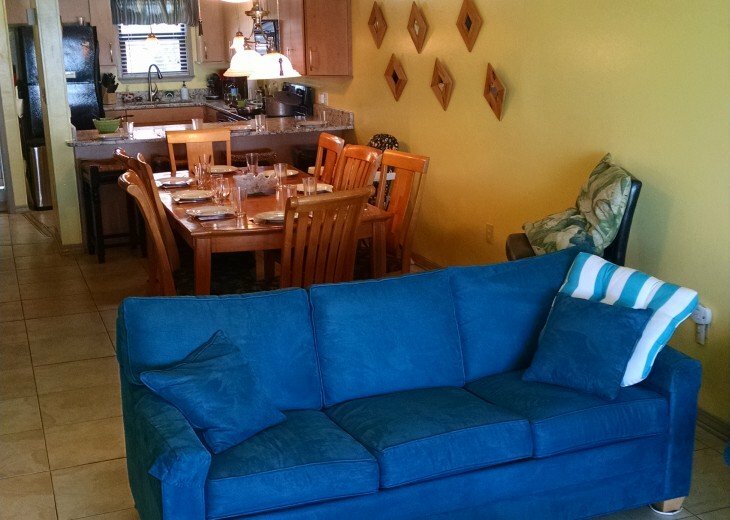 It also has the DR w/10 chairs and 4 bar stools, as well as a fully-equipped kitchen. LR has its own Smart TV, DVD, lots of family board and card games, books, and DVDs. There's a set of Oldies for dancing on the decks and in the LR. In addition, there’s a BA w/tiled shower and glass door for those sleeping on the sofas. 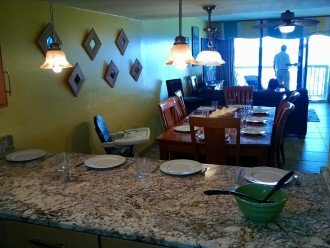 Fully-equipped kitchen has granite countertops and Euro-style maple cabinets with microwave, disposal, refrigerator w/ice maker; espresso, crock pot, griddle, fondue pot, French coffee press, coffee grinder, coffee maker, mixer, blender, toaster, shrimp boiler, margarita, ice cream and waffle machines. It is equipped w/plenty of dishes for large groups, glassware, cooking and grilling utensils, and grillware. Treat the family to cupcakes and ice cream. Make waffles for breakfast and eat on the decks. Grill fish at night and boil shrimp for lunch. 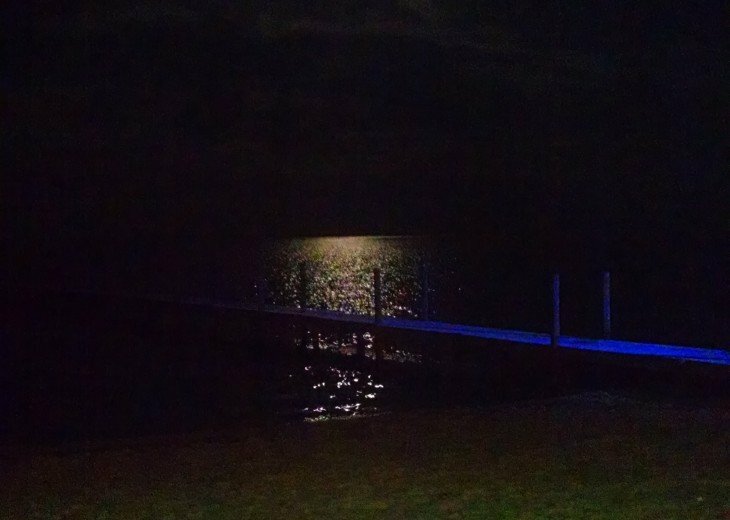 Sip margaritas on the decks and watch the sun set and the moon rise. Press your coffee in the French Press. 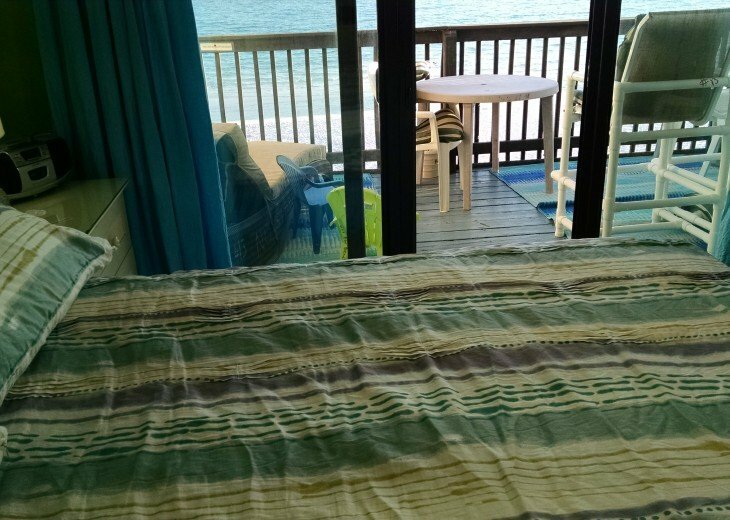 Second floor deck, over the beach, has grill, with gas supplied, dining table, chairs, large umbrella for shade, and lounger w/cushion. Read a book while lounging in the shade of the umbrella. Fire extinguisher is adjacent to the grill. Safety gate is for babies and pets. 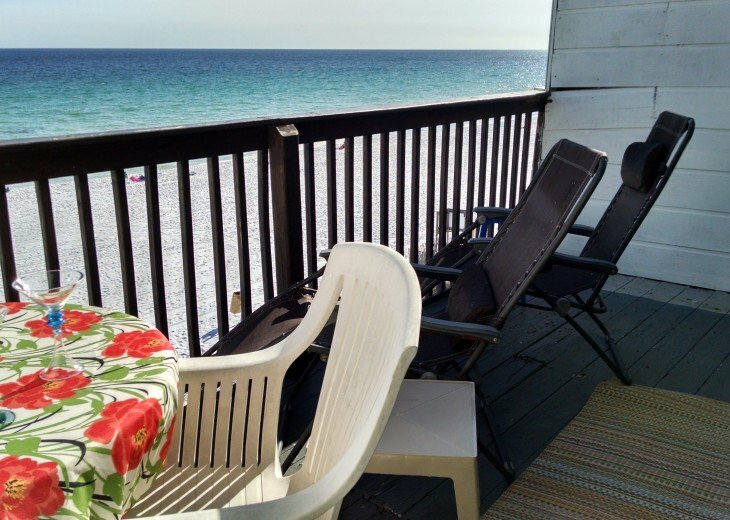 That deck also has steps to the apartment's deck, which has steps to the beach. Watch the dolphins play in the early morning hours and marvel at the huge ships visible on the horizon. Watch the Air Force jets zoom by the house. 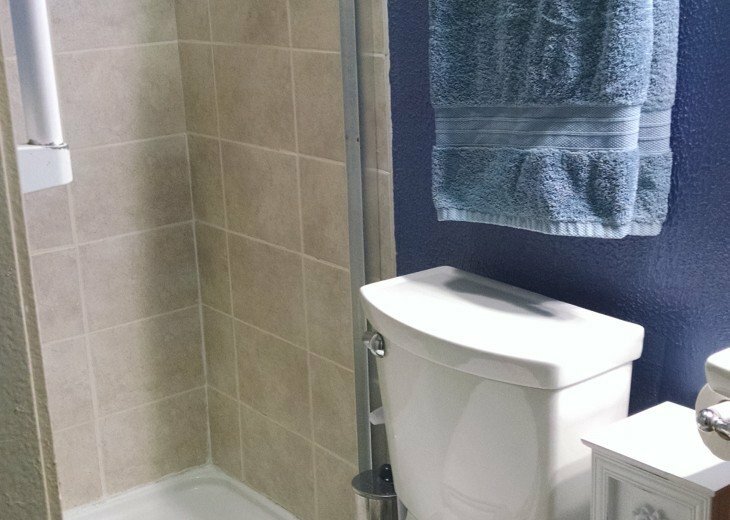 THIRD FLOOR: has 2 BRs, with ensuite BAs. Each BR has its own private door and private BA. 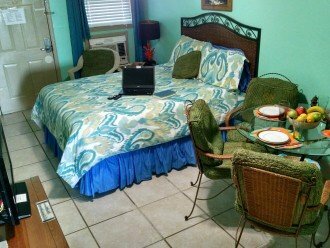 MBR has queen pillowtop, ensuite full bath, Smart TV, DVD, and deck over the beach. 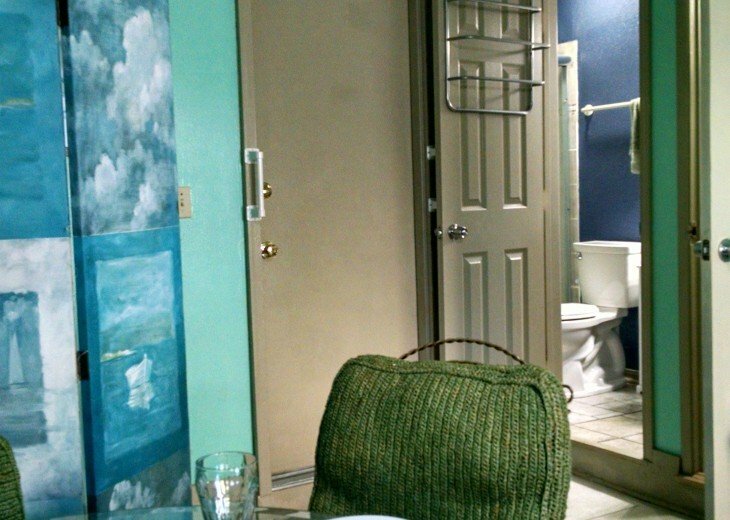 BA has tiled walls, ceramic bathtub, and glass door. Secured internet throughout house. 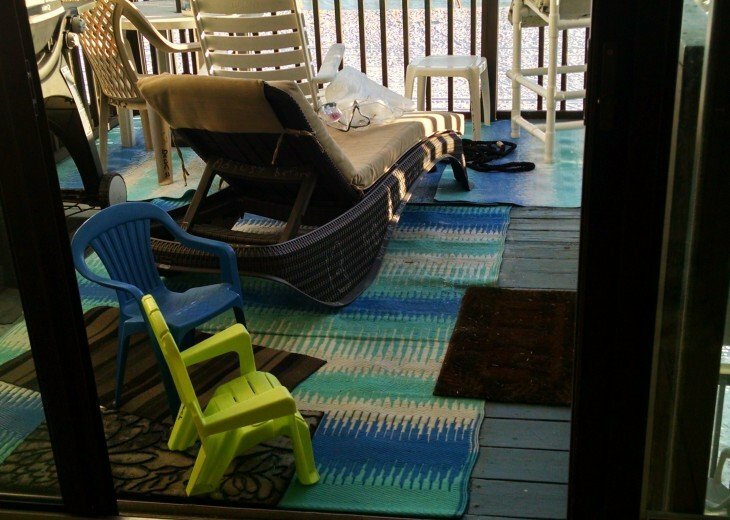 Deck is furnished w/chaise w/cushion, dining table, and chairs. There's nothing like stretching out for an afternoon nap in your own chaise lounger. Deck also has a large umbrella for shade. BR has CO and smoke detectors, as well as multiplugs for all of your electronics. The 3rd floor streetside BR also has a full ensuite bath. 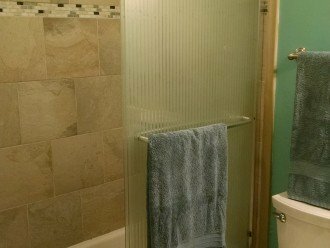 BA has tiled walls, ceramic bathtub, and glass door. There is a queen pillowtop, Smart TV, and DVD. BR has its own private door. 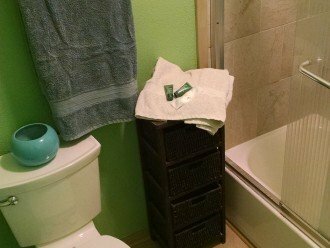 CO and smoke detectors are located in the BR, as well as multiplugs for all of your electronics. 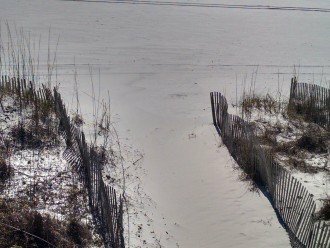 Disabled: we work w/30 A Bike Rentals for those needing beach wheelchairs, which are designed for rolling on sand. 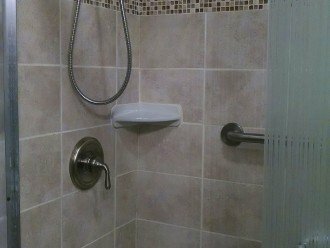 We also have a shower bench and handrails for the bed and walk-in shower, with railing and bench, in the ground floor apartment. 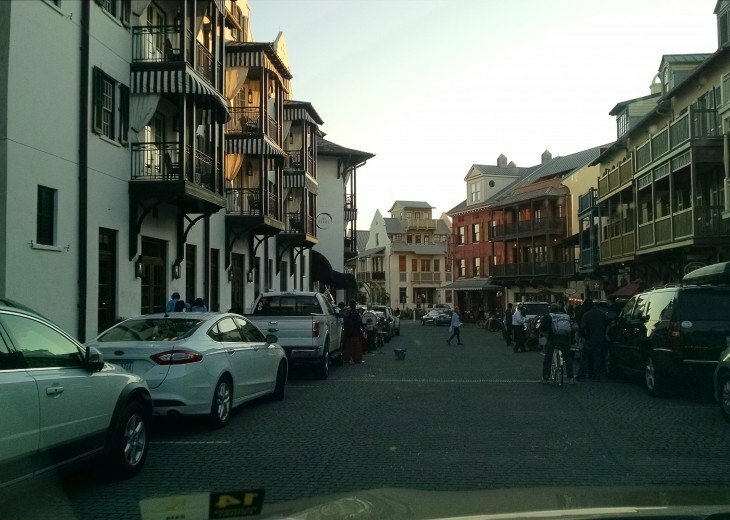 We're close to Wine, Jazz, Seafood, Mullet, and Art Festivals and the Fishing Rodeo. We offer Year round Specials, Savings, and Discounts. Each season has its own festivals. Golfers....book your Tee-times in advance w/us. We're close to many golf courses. We work w/a Golf Concierge. Events planner also arranges fishing and golfing events. 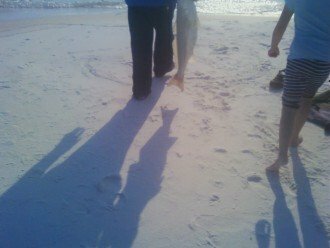 Want pictures on the beach with you and the family and pets, arrange with us. 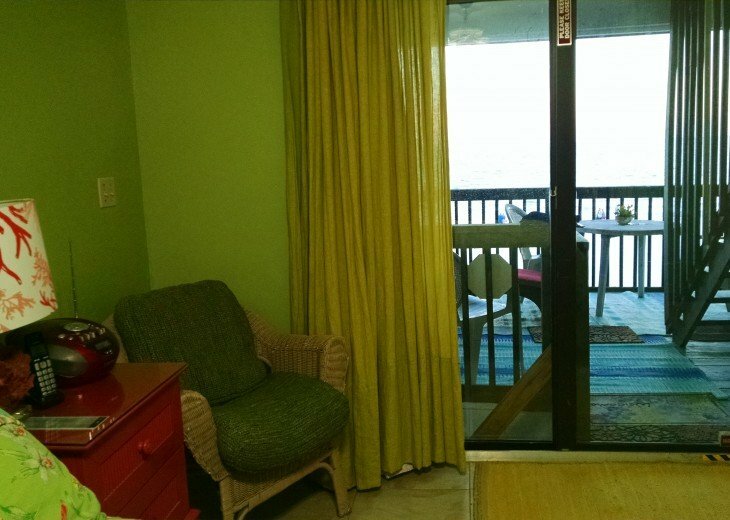 All floors have beautiful views of the emerald green gulf. 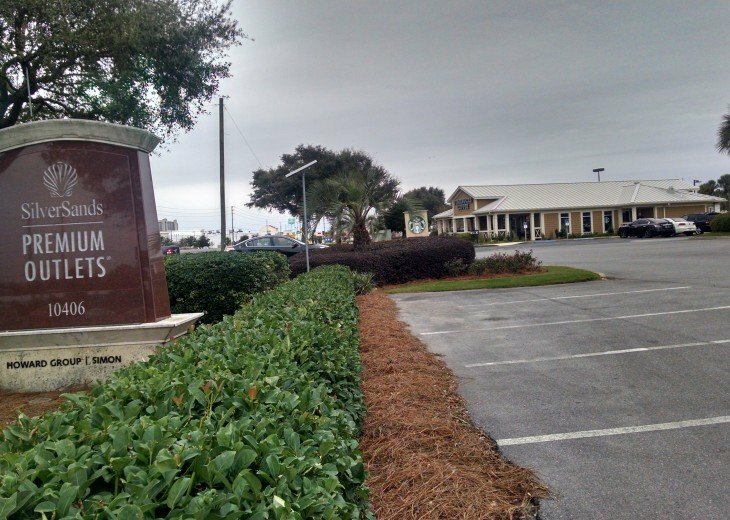 Convenient location, adjacent to Pompano Joe's, and just a few miles from airport, mid-bay bridge, Destin Commons, Harborwalk, Baytowne Wharf, Grand Boulevard, Silver Sands Outlets, and downtown Destin Harbor. 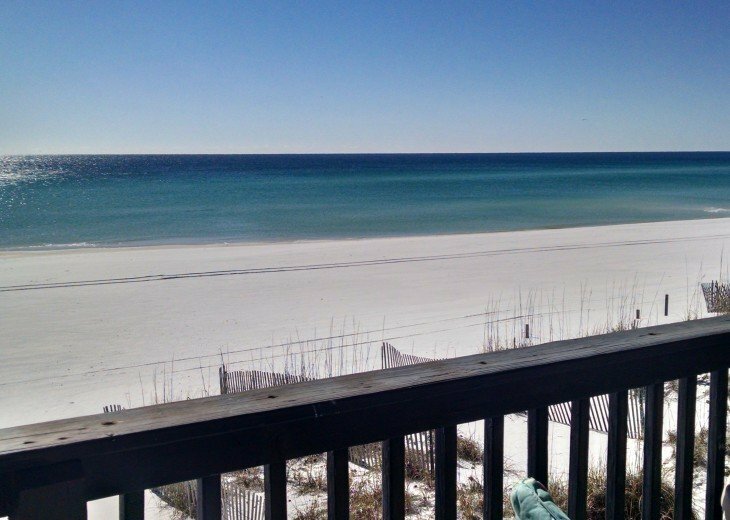 Great views east to Sandestin and west to Destin. Stargazing and wine-sipping at night from decks. Complimentary wine provided upon check-in. Adjacent to Pompano Joe restaurant. Keywords: Townhouse; not as large as a house. Adjacent to Pompano Joe's Restaurant and 3 miles from Silver Sands Outlets, Destin Commons, Grand Boulevard, Baytowne Wharf. 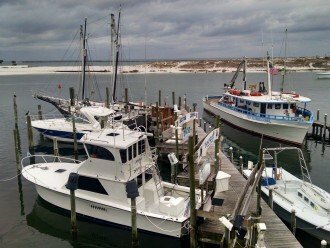 Five miles to Destin Harbor and Crab Island. Lots of live music venues w/singing, band, and dancing. We provide you an extensive guide to the house and area. Propane provided for grill. Complimentary wine upon check-in. 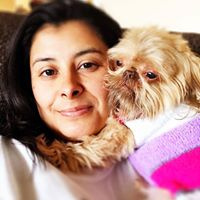 Crock Pot, Toaster, Griddle, French Coffee Press, Coffee Maker, Ice Cream Maker, Drinks Maker, Espresso Maker, Waffle Iron, Mixing Bowl Beaters, Shrimp Boiler, Fish Griller, Stainless Steel Grill Plates, Fondue Pot. 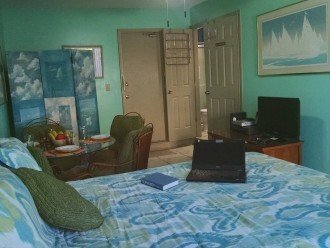 CDs for dancing and listening; Netflix and Smart TVs, Multi-plugs for charging all of your electronics; Radios in all BRs; TVs, DVDs, huge selection of cable stations; plenty of paperback books for reading on the beach; sateen sheets and pillowcases; thick towels. 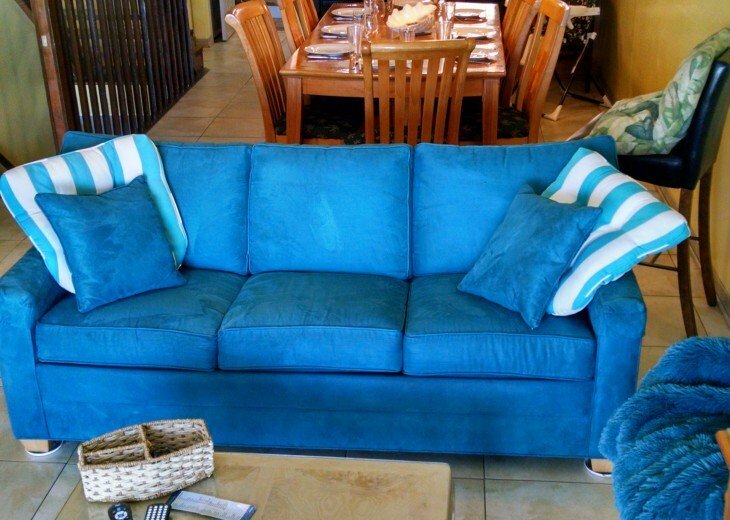 All decks have plenty of cushions for the dining chairs, tall bar chairs, and chaises. Adirondack chairs provided for the beach, along w/a large umbrella. We do not charge a Pet Fee, which saves you an average of $25/day. No exotic pets are allowed. If your pet is on an insurance exclusion, the pet will not be allowed. About the owner: I'm a retired school librarian. Why this property? 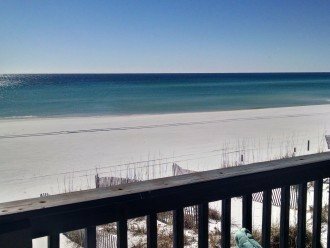 I chose our place in Destin because of the beautiful white sand beach and emerald water in front of the house. I had looked at other places in Destin and found the water to be cloudy. It's also within driving distance of where I live. We're also close to Wine, Jazz, Seafood, Mullet, and Art Festivals and the Fishing Rodeo - all events, which I enjoy and anticipate yearly. Had everything we needed for our large family! Lois(the owner) was fantastic and easy to work with. Will be back for sure!!! Loved it! Everything I was hoping it to be. Very clean , felt like home. Beautiful property, nice views, Very well located. Everything you need is handy. My family and I had a wonderful stay . It's that time again at our favorite vacation beach spot! 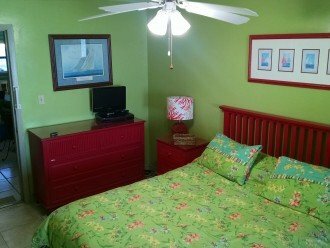 It is so convenient to grocery stores, drug stores, outlet shopping, restaurants, leisurely activities to do, scooter rentals, parasailing (on the beach next to this property), souvenir shopping......,etc. 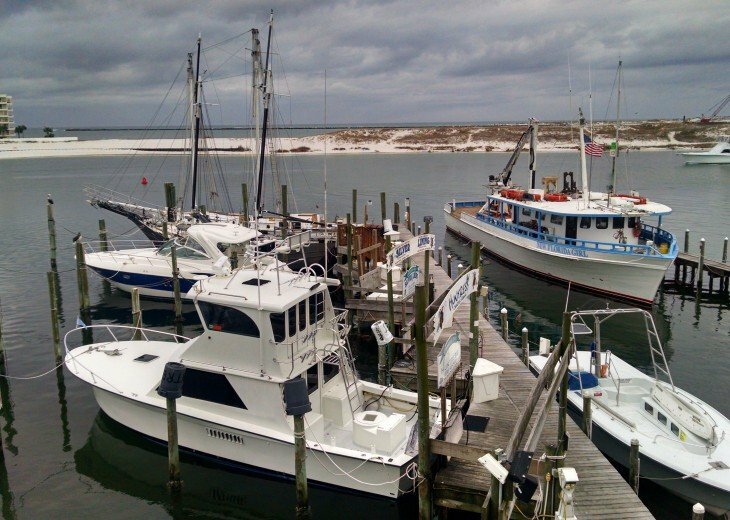 Pampano Joe's is next door and one of our favorite restaurants in Destin. With it within a block away, if we are on the beach and just want to walk over and have lunch or dinner, what at better atmosphere than right on the beach, without getting all dressed up, not to mention dealing with traffic. 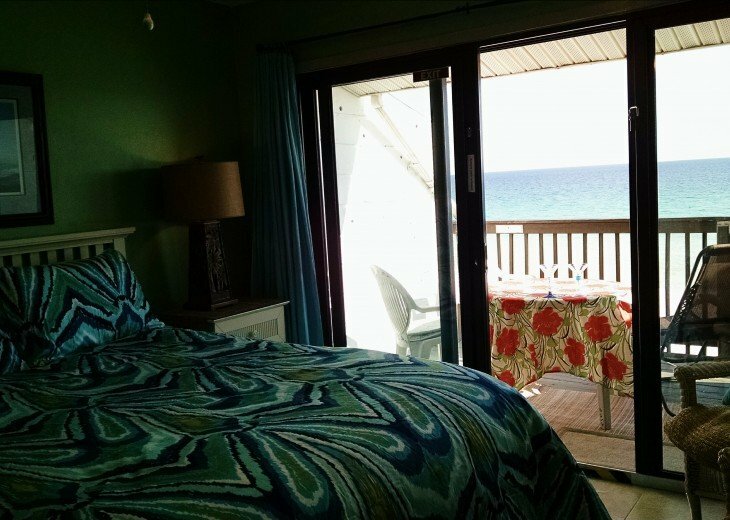 This vacation spot is right on the beach , 3 stories with beautiful views! 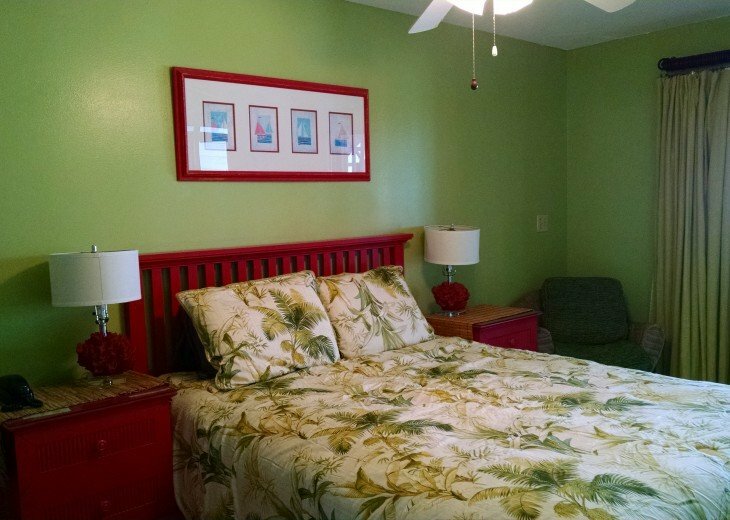 If we want to bring family or friends, it is very accommodating and sleeps 12 comfortably! The owner is extremely nice to work with and available for any questions or issues that might come up! She even allows pets which is one of the few vacation places that allows pets. Our family cat goes with us. 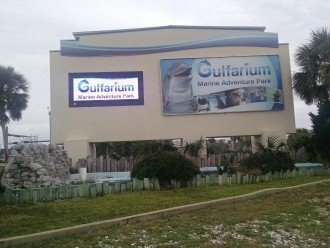 Each year when we go, something new has been added or updated! 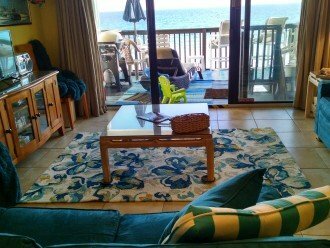 It definitely has all the amenities and convenience of gadgets and small appliances, to an outdoor gas grill, to beach umbrellas, chairs, and sand toys. 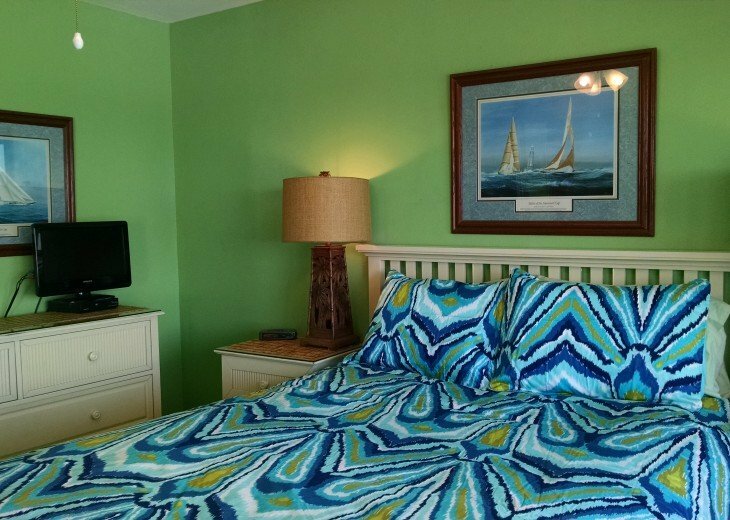 We love it here and highly recommend this home away from home vacation spot! Our stay here was excellent. 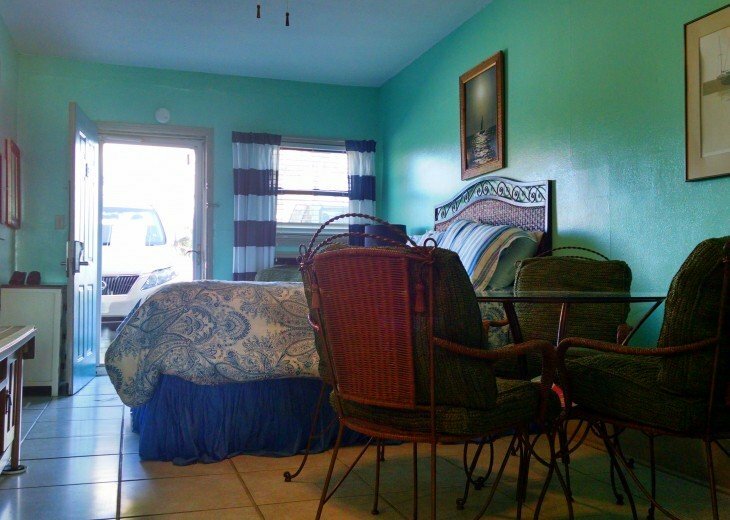 This townhome is directly on the beach and within walking distance to Pompano Joe's restaurant. We will definitely be back!!! 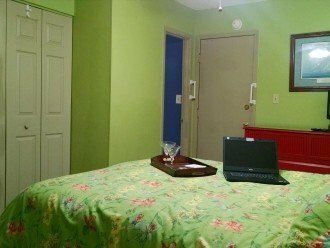 We enjoyed our stay and had everything that we needed and more! Nice, clean and on the beach....couldn't ask for a better location. Parking is tight but it does state that, so we were prepared for that. 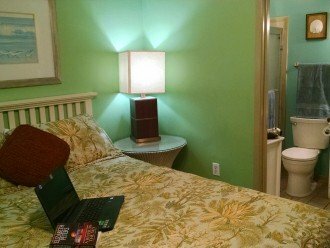 We couldn't have been more pleased with our stay here!! Lois, the owner, was very helpful prior to and throughout our stay. 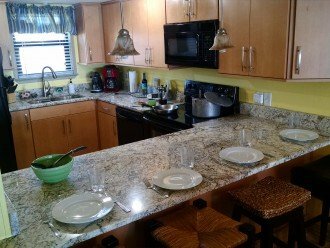 The townhome is in a great location, within walking distance to several shops and restaurants, and just a short drive to the main strip! With 15 people, it was great having a parking space large enough for four vehicles. 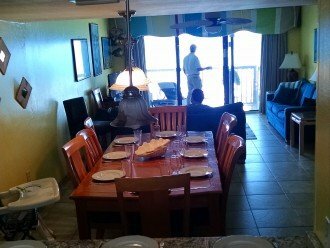 The house was very nice and clean, and we loved the views from the three balconies and being able to step right outside into the sand. The beach wasn't crowded as it's private to just the townhouses there, which we loved. We definitely recommend! 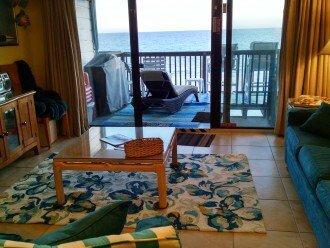 We just returned home from a week stay at this condo! First I want to say thank you to the owners for the excellent customer service they provide. We have stayed in this area several times and rented through a rental company. 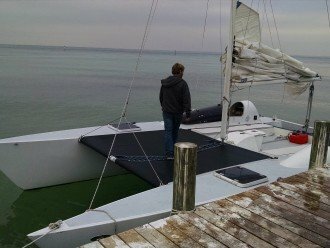 Our experience was far better renting directly from the owner. She wants to ensure you have a fabulous week. This location sits right on the white sand beach. We loved getting up in the morning and sitting on the deck listening to the waves and the sunset view in the evenings is unbelievable. Several mornings we even saw dolphins go by. There are many restaurants, stores and shopping very close. Pompano Joe’s restaurant is next door, a brand new Alvin’s Island is going up less than a block away, grocery stores and outlet shopping is just a few minutes away. 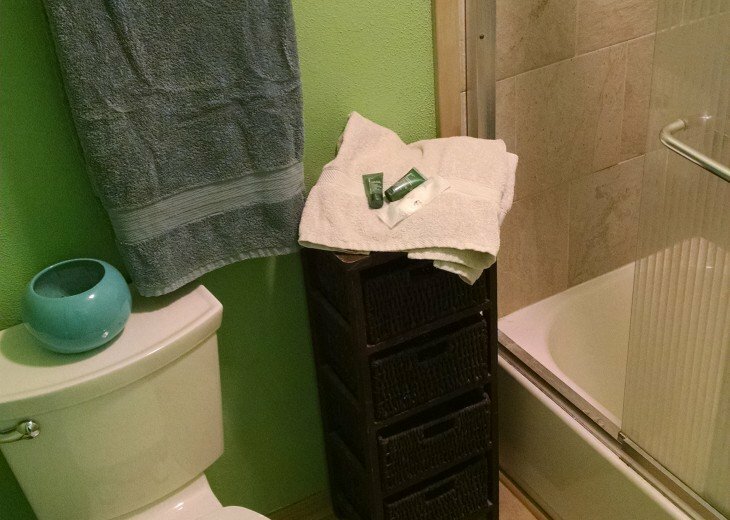 The condo has all the amenities of home and allows pets. Since pets are part of the family it is great this location allows you to bring them along. It is very convenient to everything!! On the Beach. 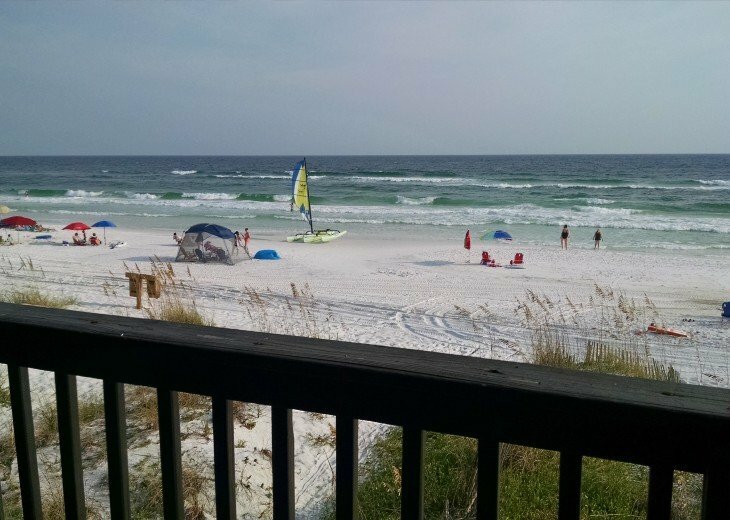 Off the deck onto "your" beach into the Gulf. We had great weather and Pompano Joe's is next door on the beach, Great. 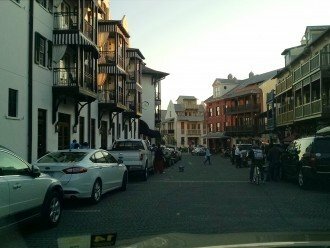 Just a few blocks to Shopping and many restaurants. The town house was so nice it was hard to leave and go anywhere. We enjoyed our stay so much. Just what we needed. 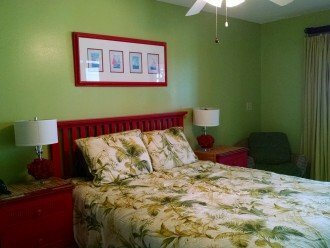 Wonderful condo with all the amenities! Beautiful view and great location! So close to so many great places to eat and visit! We love this property! This is the second time we’ve stayed here and will definitely return. 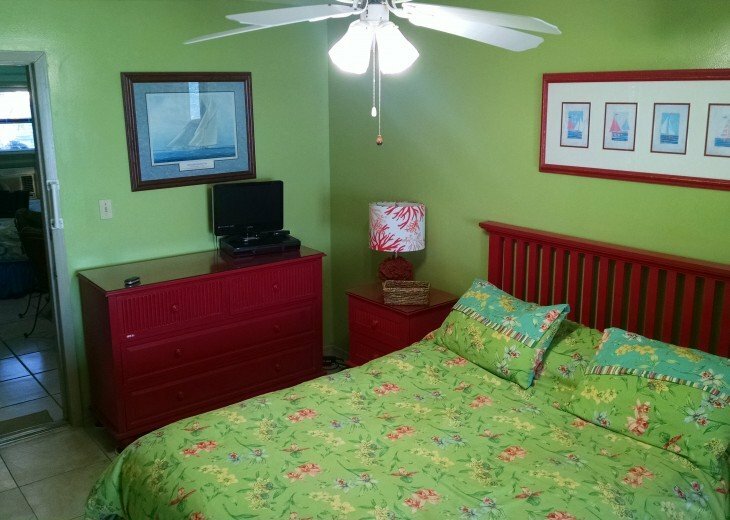 There are a lot of amenities for the kids and it’s always very clean. 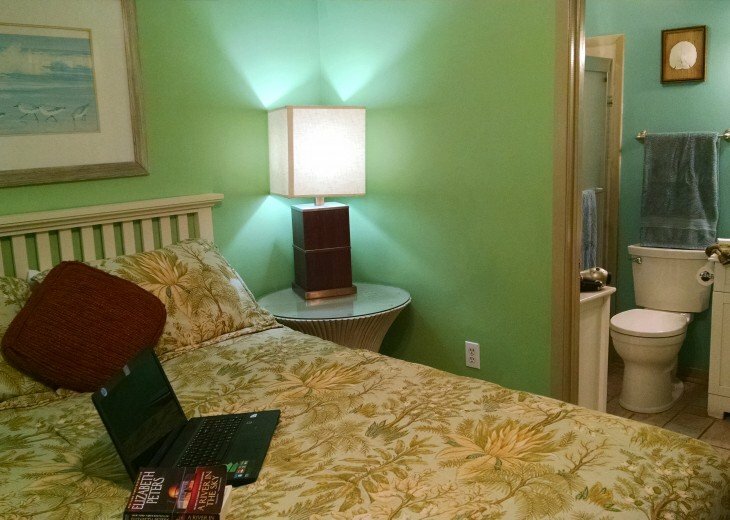 The owner goes above and beyond to make sure we have a great vacation experience. The family has been staying here for some 15 years and we have always enjoyed the condo. It is so nice to just walk out the back door and be right on the beach. Always clean and functional. Thanks for keeping everything up and the mention of all the things going on in the area. Definitely recommend to all. Thanks. 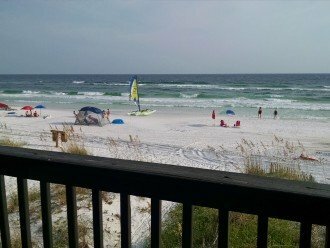 We had a fantastic vacation at Miramar Beach over the July 4th week. 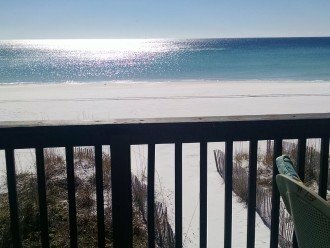 The accommodations were excellent and the beach and weather were both excellent, too. Excellent restaurants and plenty of activities for everyone. This was my family's 3rd year staying here and we already booked for next year. Lois is one of the best people to deal with. It's nice dealing directly with the owner and not some middle man. You will not find a better location in the area. 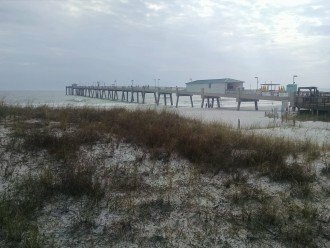 If you like a lot of beach time this is the place for you. Me and my family, 7 of us plus a dog, stayed here for a week and it was great! The house is right on the beach and the beach is private so it wasnt too crowded. The house was very roomy and newly updated. 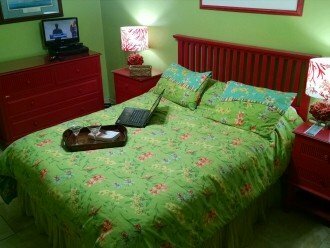 It was very clean and the beds were comfortable. 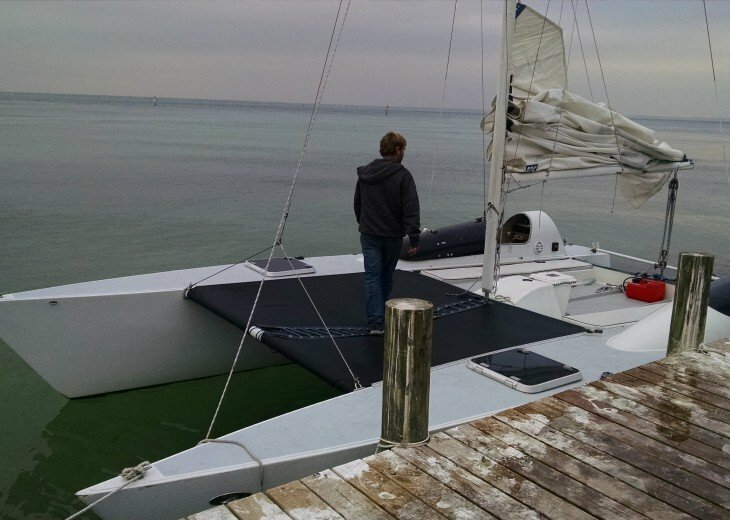 It was very nice to have 3 different decks that overlooked the ocean. There was the essentials in the kitchen and even floats and chairs for the beach. We got all of this for a very very reasonable price! Our dog was even comfortable here! We are already talking about wanting to coming back next year! Upon arrival, the house, as usual was immaculate. It's decorative and spacious with all the amenities of home. Every cooking utensil you could every need is furnished like an ice cream maker and a waffle iron. The grill on the main deck made grilling fun and it's located steps away from the kitchen. My eight month old grandson was there and the baby gates and pack and play were both welcomed and needed. He was able to crawl around freely without any fear for his safety. The older grandkids enjoyed all of the floats and beach toys that were available for their use. 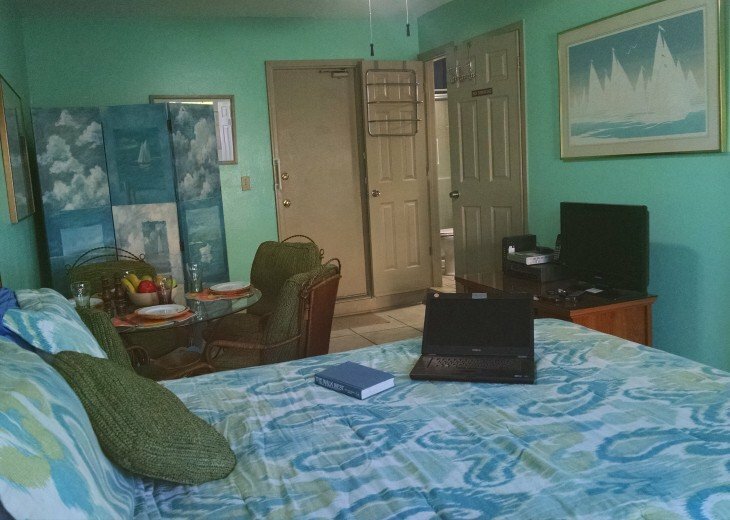 This place gives all of the comforts of home while enjoying the beautiful beach that is steps away from the condo. 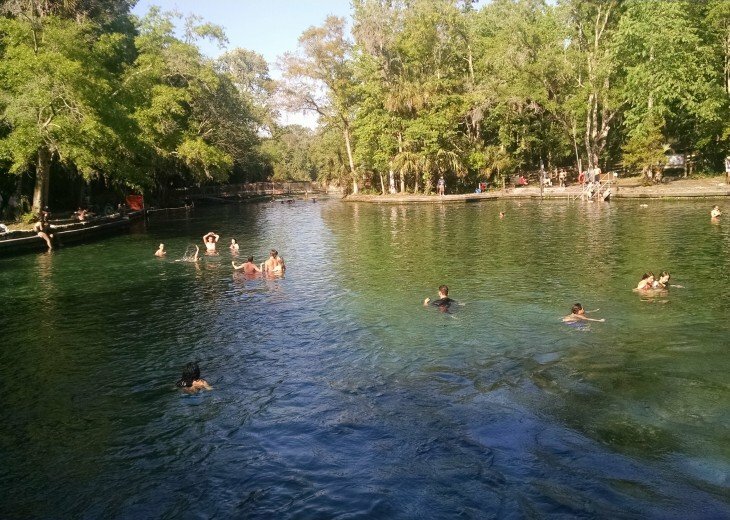 We are already anticipating our next visit and highly recommended this spot for your next trip to the beach whether it's a family vacation or a romantic getaway. 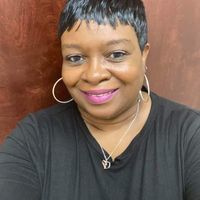 The owner Lois is wonderful and is a phone call away to answer any questions or take care of any concern you may have. 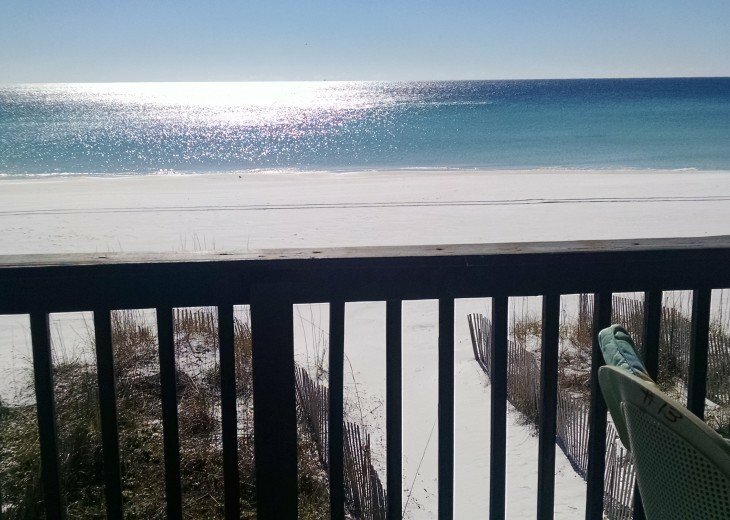 Again what a wonderful vacation time at one of our favorite beach rentals! We could go to Gulf Shores which would be a whole lot closer but we choose this rental. 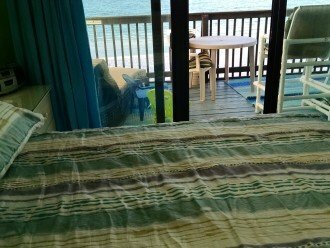 It is so convenient to grocery stores, drug stores, outlet shopping, restaurants, leisurely activities to do, scooter rentals, parasailing (on the beach next to this property), souvenir shopping......,etc. One of our favorite restaurants is within a block away (walking distance) on the beach.....Pampano Joe's! If we are tired from the beach and don't want to get all dressed up nor deal with driving traffic, it's so nice to be able to just walk next door! 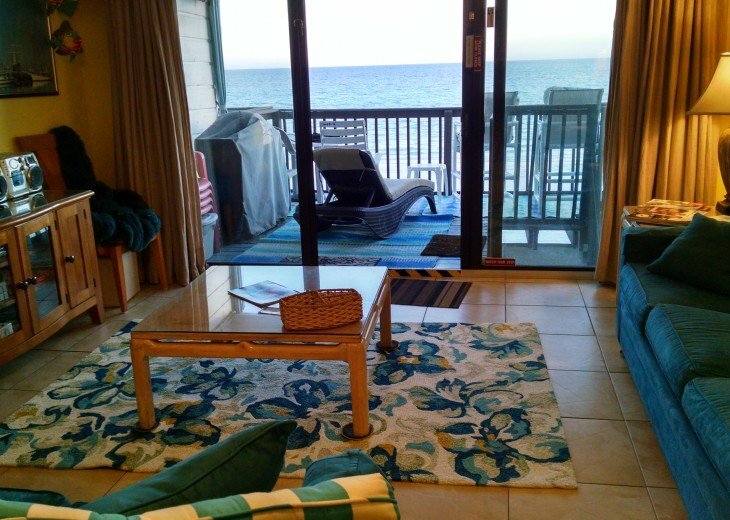 This condo is right on the beach , 3 stories with beautiful views! The owner is extremely nice to work with and available for any questions or issues that might come up! She even allows pets which is one of the few vacation places that allows pets. Our family cat goes with us. 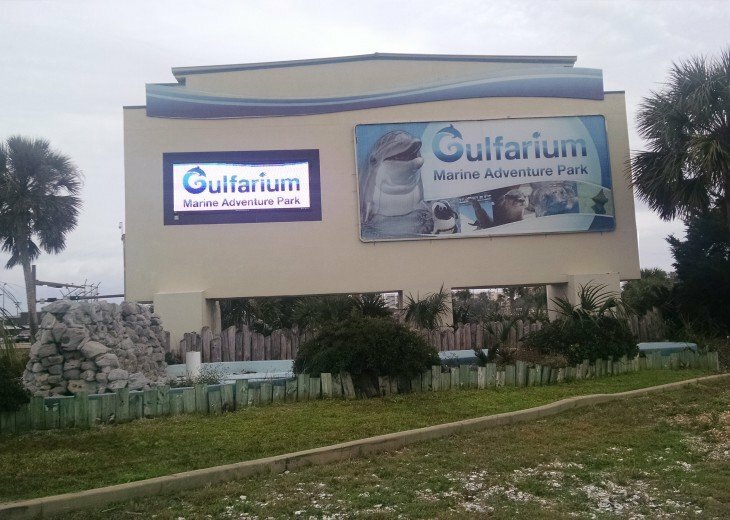 Each year when we go, something new has been added or updated! 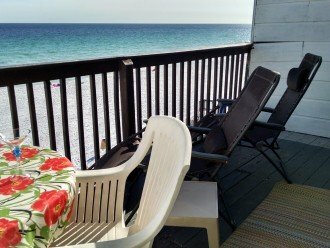 It definitely has all the amenities and convenience of gadgets and small appliances, to an outdoor gas grill, to beach umbrellas, chairs, and sand toys. 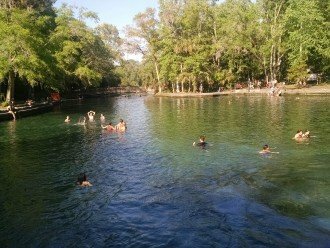 We love it here and highly recommend this home away from home vacation spot! We spent an amazing one week at this particular property. Everything was great. Owners were very informative and responded immediately to any questions we would have. The best thing was that as soon as you walk out the back door, you are on the white sand beach. All members of my family had a great time. Thank you very much! 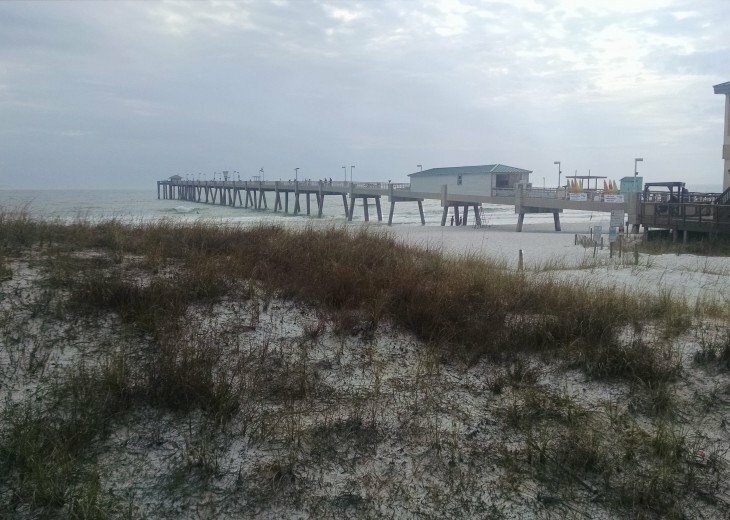 After multiple trips to the beach at this location on Scenic Gulf Drive, the quality and standard of the property is still outstanding. The home was immaculate and beautifully furnished. From the appliances and kitchen gadgets for cooking (if desired) to the toys available for small children, everything that can make you feel at home was provided to make the experience that more memorable. Each trip to the beach has been better and better and I look forward to my family's next vacation there. Our 2 families had a great time here. It was in a perfect location with everything close, golf courses, shopping outlets and restaurants. We will definately be back, hard to beat walking out your door right onto a beautiful white sand beach with plenty of activities nearby. They take great care of the place and have everything you need. Nice to have a kitchen to cook in and have nearby restaurant options. Owners were very easy to deal with and they make sure you have an enjoyable visit. I give this place an 11 out of 10! Thanks again Lois. Seriously the best people to rent from and the views are amazing! Beautiful, spacious condo. Mary Poppins clean. The pictures do not do it justice. The only place I will stay at Mirmar beach. We have been staying at this condo since 2012. We had an awesome time. Loved everything about our town house it is right on the beach and the views from all the balconies is amazing. Lois is very easy to work with and made sure we had everything we needed. Great Location. Hope to stay here again!! Perfect location. Distance from the townhome to the water could not be any closer. Lois is so easy to work with and keeps the rental stocked with so much. 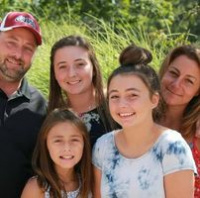 Great family vacation. Could not have asked for a better time. Our family of 12 people and 2 small dogs stayed in this townhouse for the second consecutive year. 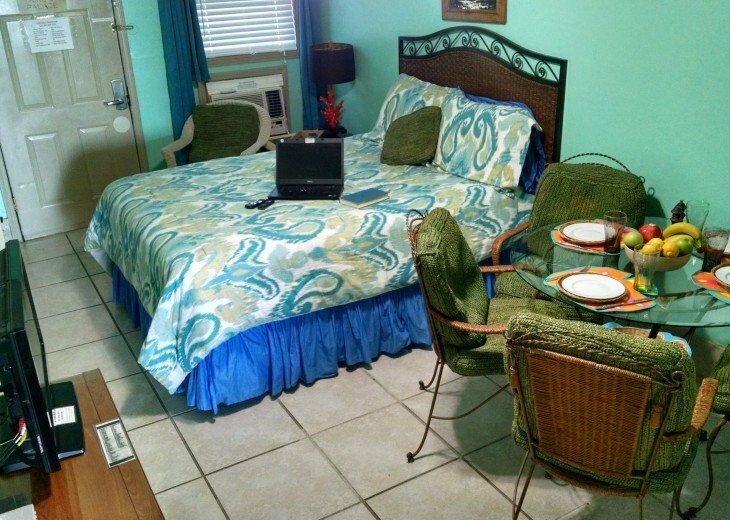 It is so conveniently located and is directly on the beach. The owner, Lois, is very easy to work with and a very nice lady. Lois and her husband update the townhouse regularly and keep it well stocked. There is a storage area downstairs that is loaded with balls, floats, umbrellas, and other beach equipment. 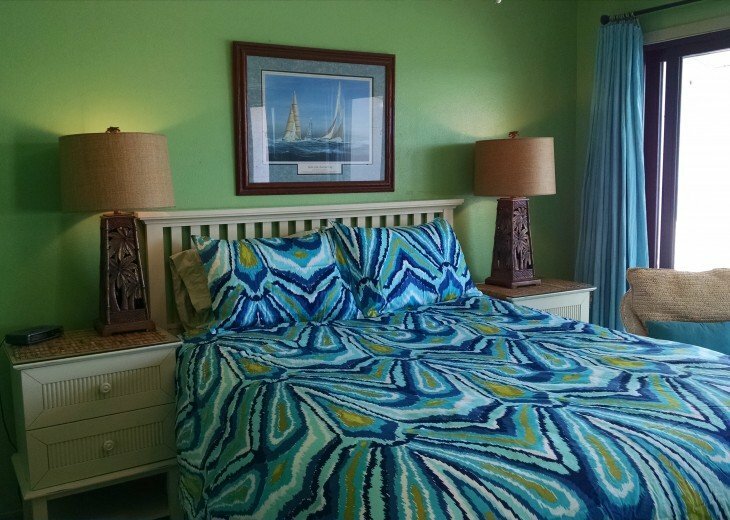 If you are looking for a place directly on the beach and a place that is not so crowded, this is the place for you. It is fabulous.